Oliver Stone's “Heaven & Earth,” a film made at the creative height of his career, is one of those admirable grand failures. Every great filmmaker has one or two of these in their filmography. Like David Lean’s “Ryan Daughter” or Michael Cimino’s “Heaven’s Gate” after the acclaim and success of 'JFK" Stone seemed to have been given carte blanche and a big fat cheque to make this intensely personal film, which unfortunately suffers the fate of drowning under it’s own bloated excess. After numerous films about the Vietnam War there had never a film dramatized from the point of view of it's own people. So with "Heaven & Earth", the premise was a decent starting place. Hiep Thi Le plays Le Ly, a young Vietnamese girl who narrates the story of her tumultuous life. She starts off an innocent rice farmer idolizing her mother and her peaceful way of life. We get to see the pre-colonized lifestyle of the Vietnamese people, who lead simple lives, connected to nature and family. But of course we watch as the French take over the country, and then the Communist Viet Cong and then the ugly Americans. Along the way Le Ly gets corrupted by these aliens in her society. She’s sold into a job housekeeping the estate of a rich businessman, whom she’s eventually raped by and thus impregnated. After shaming her family she takes to the streets, becoming a hustler and parttime street prostitute. 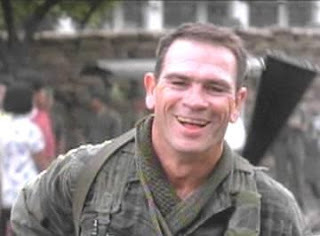 Eventually the heroic and love-smitten figure of US soldier Steve Butler (Tommy Lee Jones) appears, sweeping her off her feet . He brings her back to the US and into another alien and ironically even more corrupting environment. Unfortunately Butler turns out to be sadistic psychopath who turns devilish very fast, becomes abusive, beating her, and threatening to kill her. But Le Ly is a survivor, overcomes the culture shock and makes good on the American dream, achieving wealth and success, but her life can only be fulfilled completely when she returns home to reconcile with her mother. “Heaven and Earth” is only interesting for Oliver Stone buffs who want to follow the path of his career. The visual style fits in well with the language he established with his post Wall Street films – 'The Doors', 'Born on the Fourth of July' and 'JFK'. Robert Richardson’s photography is top notch, beautifying everything he shoots. His photography of the Vietnamese landscape, with carefully chosen compositions' heighten the colour green, providing an ironic counterpoint of the beauty of the land with the horrors of war. Unfortunately everything else in the film stinks. Stone’s decision to have all his Vietnamese actors speak English exclusively is a fundamental fault. Sure, he was going for a mass audience, thus removing the need for subtitles, but his integrity for the culture of the country is lost and the acting abilities of the actors with the foreign language do not hold. Stone races through the events of Le Ly's life with such speed it feels like one disastrous confrontation and event after another. And so when she starts to achieve her success as an American, the irony of this hits a hammer even blunter even by Stone’s own standards. Though Stone's reach was much larger than his grasp, it's a risky venture which great filmmakers need to take , a mistake which cinema history quickly forgave. "Heaven & Earth" was certainly not a career-breaker as Stone would go on make "Natural Born Killers" later that year, and "Nixon" two years later.